With the oldest turning 19, Generation Z is getting ready for take off to show the world what they’re made of. They are intelligent, there are nearly 2 billion of them mostly outside the Western hemisphere, they can teach us a lot about technology and they want our attention as we want theirs. I’ve been getting to know Generation Z for over 3 years professionally, 15 personally. I believe this generation is highly capable of accomplishing tremendous feats as adults (and kids), largely because of their mastering of technology. However, others believe Generation Z will not succeed as adults because they spend too much time on their screens. So to begin deciphering the discrepancies, I travelled back in time to Marketing 101 and did a SWOT of Generation Z (I’ve always loved SWOT’s). While Generation Z is still a young generation to be labeled, boxed and stereotyped, SWOTs force us to wear an observational and critical lens which will help preceding generations see what Gen Zer’s have to offer. 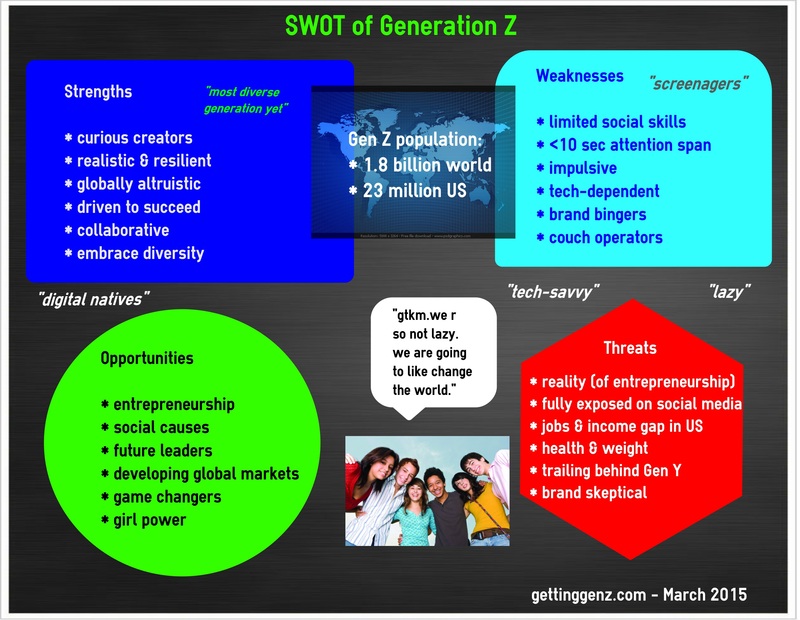 Following this week’s info graphic is a complete report that I’ve written on the SWOT’s of Generation Z. Take a look at this first, I’d love to know what you agree and disagree on.